blog action day: thinking about poverty | doberman pizza. 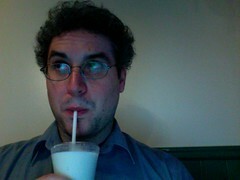 “really, though,” I thought to myself while jotting down notes about blog action day’s chosen topic of poverty, “what am i doing sitting here, sipping on a milkshake, when the three dollars I paid for it could have paid for a meal for a hungry child?” I still don’t have an answer. But it did get me thinking—thinking hard enough to put together a few thoughts on a topic I admittedly don’t think much about. thinking about wealth, family, and social position, and how I tend to take them for granted, just because that’s the way things are. thinking about what poverty means in Canada, one of the more affluent nations of the world—where, according to my own employer, the Conference Board of Canada, and to OECD statistics, one out of every seven children lives in poverty. thinking, and wondering what in the world one person could do to stem the tide of what has been and continues to be a global epidemic that afflicts billions of people. In 2001, the United Nations set eight overarching goals for development, the “Millennium Development Goals” (side note: I’ve gotten real tired of things being named “Millennium”. they named a bus stop near my old high school “Millennium” for pete’s sake). The first of these goals—which also touched on topics such as education, gender equality, and the environment—concerned the eradication of extreme poverty and hunger. Specific targets? halve, between 1990 and 2015, the proportion of people whose income is less than one dollar a day; achieve full and productive employment and decent work for all, including women and young people; and halve, between 1990 and 2015, the proportion of people who suffer from hunger. That’s no small task, I pondered to myself as I looked for a way to tackle this issue from my own perspective. How in the world are they supposed to do that, especially given the repeated failures of aid programs through corruption, misappropriation of funds, the creation of dependency in the receiving nations that elicits cries of “neocolonialist pigs!” in the radical West? Sure, according to the Food and Agriculture Organization, there’s enough food in the world to feed everybody, but aren’t there still 780 million people who are still chronically hungry? What are they going to do, air-drop hamburgers? Thankfully, through the agency of some good-natured spirit, I happened to find out about a study session on the Baha’i International Community’s recent statement, Eradicating Poverty: Moving Forward as One that happened tonight. After attending and taking a bunch of notes, I put together a few highlights in typical dan-jones style that I’d like to share with you. Poverty is high on the international agenda right now. Everybody wants to do something, and that’s great! But there’s a lack of direction—so many things have been tried to alleviate and eradicate poverty that haven’t worked, and everyone involved is desperate to find new solutions. The main big thing that’s been tried is the transfer of financial resources. You know, sending truckloads of money. But that hasn’t worked real well for the recipient communities. Trillions of dollars in financial aid have been sent, and still people are miserable, because the money doesn’t get all the way to those who need it, or dependence on rich countries is created, or whatever. So what’s the alternative to dumping money? Well, the thing is, poverty’s not just about money. A lot of the problems of poverty are rooted in values. Moral, intellectual and social capacities are needed to alleviate poverty; absence of those ethical, social and material resources needed to develop those capacities in individuals, communities and institutions is itself poverty. So our goal should be not only to remove the ills of poverty but to engage the masses of humanity in constructing a just global order. Individuals have to be helped to reclaim their dignity and sense of self-worth; be encouraged to gain confidence so that they can improve their condition and strive to realize their potential; and be nurtured to become a source of social good. Society’s institutions must serve as channels through which the talents and energies of those individuals can be harnessed in service to humanity. Once we have the resources to develop this kind of individual and institutional capacity, we can say we have true wealth. So, here’s another thing to consider—we know that certain principles (trustworthiness, gender equality, freedom of religion, human rights, access to education) tend to correlate positively with socio-economic well-being and stability. We need to find principles like these that will guide us and help measure progress. this sort of principle-based approach will allow us to address long-term concerns, not just apply short-term fixes. The decision-making process has to have integrity: those who are affected must be part of the process. the process must likewise be governed by transparent, agreed-upon ethical standards. Two principles offered by the Baha’i International Community as guides for efforts at poverty eradication: justice and unity. Justice provides the means to harness human potential to eradicate poverty through laws, adjustment of economic systems, redistribution of wealth and opportunity, and adherence to the highest ethical standards at all times. Unity means that progress is systemic and relational, that a concern for the family as well as the local, national and global community must guide poverty alleviation efforts. After reading these Coles Notes, you should read the statement, which goes on to explain further principles that need to be included in efforts to alleviate and eventually eradicate poverty, such as integrity in governance, individual responsibility, sustainable development, renewed focus on agriculture, and the elimination of over-concentration of wealth, meaningful employment, the role of religion, and so on. The statement really struck me with its boldness and directness. I found the references to the shortcomings of Gross Domestic Product (GDP) as an indicator of the overall economic health and wealth of nations to be quite interesting; someone in our session mentioned the Genuine Progress Indicator (GPI) as an alternative indicator that seems to be far more holistic and useful. What do I do, though? In the end I have to come back to that. What does one person do to combat poverty? I wonder because I have no clue what to do sometimes, especially when faced with poverty in my own country, my own city, on my own street (yes, there’s a fair bit of poverty on my street). Is it enough to pray? It’s a nice thought, but no, it’s not enough. Give to people begging downtown? No, you don’t know if your act of giving will actually help that person. Give money to the new charity-meter in the Byward Market? Better than giving to someone who begs, but still just a drop in the bucket. Plus, you don’t actually see where it goes. Give regularly to charities who work with the poor? That’s cool; depending on the charity, it can really make a difference, but you have to know the organization and make your choice carefully. Volunteer? That’s great, but it has to be regular; charities get plenty of people who want to show up one day and then never show up again. Give a man a fish, and he’ll eat for a day; teach him how to fish, and he’ll eat for a lifetime. After reading through the Baha’i International Community’s statement, I think the approach to combat poverty—on the international scale and on my own personal scale—has to be of the latter kind. Baha’is have the bounty of decades of experience in the field of capacity development through socio-economic development projects such as FUNDAEC, as well as the study circle curriculum pioneered by the now-ubiquitous Ruhi Institute. Can poverty be reversed through such programs? Sure it can—just read about the microfinancing project started by FUNDAEC in Colombia, for example. Is it doable? Sure—Baha’is in Ottawa have spent the past year offering study circles in neighbourhoods to help strengthen community ties and raise up individuals who can offer the same kind of service on their own. And my own contribution? Well, I don’t know if children’s classes count as a measure to alleviate poverty, but I’m already starting to think of ways to incorporate some of those “essential values” into our curriculum. Thinking… thinking… well, if nothing else, it’s a start—especially for someone who never really thought about it before. This entry was posted in baha'i blog, by the way..., journal and tagged economics, ethics, human rights, poverty, reflections, united nations by danger. Bookmark the permalink.